Well… it’s not like my training is going stellar. And my last half was a little rough and dirty. So I go to look up the race details on this one and I see on their website the phrase boasting, “The Flagstaff Marathon…is known as one of the most challenging courses in the country.” UMM HUH? The Most Challenging Course? I’m not prepared for the MOST challenging course! In my head, I’m super great! It’s not a bad thing to think since running is 90% mental. If you think you can, you can! And for me, I know I CAN run 13.1 miles. It may not be fast, or pretty, or easy but it’s definitely doable. So sometimes that confidence brushes up to cocky and I think, “I know I can, so I don’t have to train today! 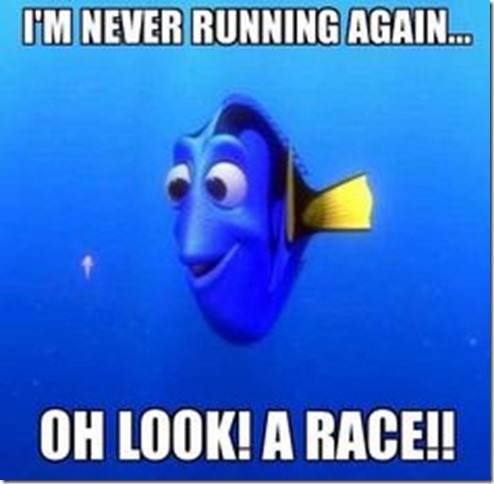 !” You know why some half or even full marathons go better for me than others?! It’s because of how I’ve treated my body up until race day! Was I putting in the work? Was I eating right?? Did I let myself slip and give myself excuses? So yes, I CAN run a half marathon as long as I’m training right. I have to admit to myself that I’m not super woman that can wake up Saturday morning and run for three hours without so much as stretching before hand. Put in the work, Lindsay! Okay so new plan! I’m going to focus on hills and trails and JUST this half! And then when I’m done, I can get back to NYCM. It’s not like I haven’t been running at all. I just am not running as strong or as long as I should be. But I have a few short weeks to get my crap together and get back on track! I tell ya, I cannot wait for this weather to cool down!! Man, it’s hot out there. Even when I go out at 5 am in the dark still. Winter is coming?? ?